The CASE i3 B Lab and GIIRS Research project was undertaken from Fall 2010 through Summer 2015 to stimulate and support high quality global research on for-profit social entrepreneurship data (through data collected by the non-profit B Lab) and impact investing funds and their investees (through data collected by the non-profit Global Impact Investing Rating System). The project was funded by the Rockefeller Foundation. Over 8000 for-profit impact entrepreneurs contributed data to the new entrepreneur database CASE i3 built in collaboration with B Lab. In addition, funds with over $4.5 million under management contributed data to the new funds database CASE i3 built in collaboration with the Global Impact Investing Ratings System (GIIRS). The data includes answers to the impact surveys completed on the B Lab and GIIRS sites, minus all identifying and proprietary information. CASE i3 worked to both improve the data captured and make it more usable and accessible by recommending improvements in data structures since 2011. Researchers, consulting firms, banks and others expressed interest in this data, which is relevant to those studying entrepreneurship, corporate finance, social entrepreneurship, corporate social responsibility, sustainability, social ventures, social innovation, venture capital, mission-related investing, development finance, emerging and bottom of the pyramid markets, employee practices, certifications and standards, and the role of policy in influencing corporate behavior, among many other fields. “For this field to be taken seriously, we need more rigorous independent analysis to know what, if any, difference these companies and funds are making compared to their peers. Research is the key to augmenting compelling storytelling with real data,” said Jay Coen Gilbert, co-founder of the nonprofit B Lab and its wholly-owned non-profit subsidiary, GIIRS. Do B Corporations create greater impact than ordinary companies? Does impact vary by company size, location or industry? Do B Corps make significant improvements in impact over time? Do GIIRS-rated impact investors create more social impact than other investors? Are there demonstrable benefits of being GIIRS-rated for impact investors? What, if any, correlation is there between social impact and financial performance for GIIRS-rated funds and companies? What investment best practices lead to the best social and financial outcomes (e.g. deal structures, vehicles, ancillary services)? Do B Corporations and GIIRS-rated companies successfully maintain their impact through exits and liquidity events? How? If not, why not? CASE i3 worked closely with the staff at B Lab and GIIRS to prepare releases of data for researchers and to serve as an intermediary extension of their staff in responding to all research requests during the duration of the project. We started with an awareness and education process, which included several global webinars and several in-person research gatherings. In addition to spreading awareness of this data, educating academics around how the surveys work, and preparing the databases and producing codebooks for researchers, CASE i3 also worked closely with B Lab to use researcher feedback to improve data collection content and practice. We released RFP #1 (request for proposals) in September 2012, which focused on proposals to use data from B Lab’s survey of for-profit companies in the US. From that RFP, nine research teams were selected and have begun working with the initial data set, which includes anonymized data from several thousand companies who have completed the B survey or become certified B Corporations. We aim to use the B Lab dataset to explore how B Corps as a new organizational form emerged and continue to diffuse. Specifically, we are interested in the underlying conditions that drive the B Corp movement to spread, including patterns in geographical clustering as well as factors such as legal, cultural, and industry frameworks. Our first study aims to examine the financial performance and corporate social performance of B-certified firms and B Lab social, environmental, and governance (ESG) criteria with those publicly traded, non B- certified companies operating in the same industry. Our second study plans to explore the product (industry) and geographic clustering of the B-certified, the B Impact Assessment Completers, and the rest of the firms that are still in the process of obtaining the B-Corporation certification. The third study will examine the financial performance, social impact, and portfolio allocation of Global Impact Investing Rating System (GIIRS) rated funds. Over the past three years, the Aspen Network of Development Entrepreneurs (ANDE) has been collecting data on investment vehicles focused on small and growing businesses (SGBs) in developing countries and emerging markets. ANDE will leverage data from B Lab to examine how GIIRS rated funds differ from non-GIIRS rated funds, in terms of deal size, stage of investment, region, and sector focus to inform a range of key stakeholders including impact investors, foundations, development finance institutions, and academic institutions. During this research project, CASE i3 maintained a Google Group for researchers interested in releases of data and reports from B Lab and GIIRS as well as sharing findings with peers. Ownership and management of that Google Group transitioned over to the staff of B Lab at the conclusion of the project in Fall 2015. Click here to join the B Lab and GIIRS Research Google Group. B Corp Profile Information is available here. This spreadsheet details general company information and assessment scores across categories of the B Impact Assessment. 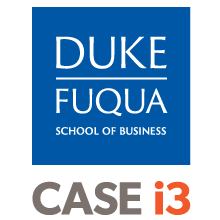 CASE at Duke University Coordinating Research for B Lab and the Global Impact Investing Rating System (GIIRS), Duke University Press release, January 28, 2011. RFP #1, released in September 2012, is now closed, but contains a lot of useful information about the data releases as well as links to a dummy data set that contains the full set of fields in the first database. RFP #2, released in December 2014, is now closed, but contains useful information about B Corporation and GIIRS data as well as dummy data sets. Join CASE i3’s Linked In group, the CASE Impact Investing Research Group. Join the B Lab and GIIRS Research Google Group. Founders and the Social Performance of B Corporations, by Li-Wei Chen and Peter W. Roberts, accepted for presentation in the 2013 Academy of Management Annual Meeting (Best Papers and Proceedings). “A Purposeholder Theory of Corporate Responsibility,” Steven Scalet and Thomas F. Kelly, draft, 2014. Does Social Impact Demand Financial Sacrifice? Published in Knowledge@Wharton, December 2, 2014. Benefit Corporation and L3C Adoption: A Survey by By Kate Cooney, Justin Koushyar, Matthew Lee, & Haskell Murray. Published in Stanford Social Innovation Review, December 5, 2014. ‘Do-good’ companies can do well for investors, Wharton researchers say. Chicago Tribune, April 2015. Early Entrants and the Spacial Evolution of the B Corporation Population, by Justin Koushyar, presented at the INSEAD-OMT-ASQ Conference on Organization Theory and New Venture Creation. “Socially Responsible Businesses and the Core Design Principles for the Efficacy of Groups,” by David Sloan Wilson, Thomas F. Kelly, Melvin M. Philip, and Xiujian Chen. In draft for The Evolution Institute, October 2015. “B-Corps – A Growing Form of Social Enterprise: Tracing Their Progress and Assessing Their Performance,” Thomas F. Kelly and Xiujian Chen. Journal of Leadership and Organizational Studies, January 2015.